This is one of those traditional Polish meals that has to be made in certain pots or pans. You know what I mean don't you? Certain things HAVE to be cooked in certain pots. I think that's part of why it tastes so good - but mostly because its tradition and cooked with love. There are sooo many names for stuffed cabbage. Golabki, Holubki...as long as it has an "ki" at the end, it all boils down to stuffed cabbage - Eastern European cooking. We always called it "gawumpki". From start to finish it takes about an hour to prepare and 3 hours to simmer or bake. Tastes better the next day and freezes beautifully. Every family has there own version - this is how I remember my mom making them. Parboil cabbage in a large pot of simmering water, cutting leaves against the core and pull them off into the water and cook until pliable; about 5 minutes. With a sharp knife, cut the thick membrane or stem off the back of each leaf, being careful not to cut through the leaf. Lay the leaf down flat and keep your knife horizontal to slice off the thick part of the leaf. Continue simmering the cabbage and removing leaves. Any leaves that cannot be used at the end, reserve for later. Saute onions in 4 Tbsp. butter until golden. Cook 1 cup of rice in 1 cup of water with 1 tsp. salt for about 7-8 minutes. Just parboil the rice. Mix ground meats with sauteed onions and add rice. Add Worcestershire, salt and pepper and paprika. Add cooled rice and beaten eggs and mix well. Hands come in handy. Depending how big the leaves are, place about 1/2 cup of filling towards the end of the cabbage leaf. Roll leaf up and over meat, fold in both sides and continue to roll into a bundle. Arrange stuffed cabbage snugly in the pot. Add any leftover cabbage leaves to the bottom of the pot. If there is any meat leftover, just form them into meatballs and add to the pot. Get Grandma's Sauerkraut recipe here! You can add sauerkraut to this recipe. Grandma always served her stuffed cabbage rolls with home made mashed potatoes, adding the liquid from the stuffed cabbage rolls to the potatoes! YUMM! Melt in your Mouth Monday Blog Hop - Lots of great recipes! This looks so good! I bet I could eat a ton of these :) Will bookmark to try this recipe, thanks! I have been enjoying reading your blog as I am also Polish, and many of the recipes are things I remember my grandma making. I haven't tackled her recipe for pierogi though! My cabbage rolls are very similar to yours except for the zaprashka- I've never heard of that. My mom would take the small cabbage leaves and chop them up and layer them with sauerkraut and bake them. I love the cabbage/sauerkraut served over a bed of mashed potatoes- yummy! THE LITHUANIAN NAME FOR STUFFED CABBAGE AS BEST AS I CAN REMEMBER WAS KAPUSTI(sp?). MY GRANDMOTHER MADE THESE AND THE WHOLE FAMILY LOVED THEM. P.S.SHE DID NOT ADD SAUERKRAUT! I ALSO SAY VERY UMMMMMMY INDEED. I MISS MY GRANDMOTHER EVEN MORE THAN I MISS HER KAPUSTI AND THAT SAYS A LOT BUT I WILL NEVER FORGET EITHER ONE!!! Greetings! My mother was Polish, and she'd make these. I've tried them myself but they are not as good as my Mom's were. :) I will have to try your "Zaprashka" - I never heard of that! Did you ever hear the word (and this is NOT the correct spelling) "Opruzhetch" ??? which was a word my mother used when she was like "braising" something. If you have (and you know how to spell it! ), please email me, I'd love to hear from you! p.s. Are you on Pinterest? I'd love to pin this recipe on there, or re-pin from you! Thanks! I always make mine stuffed with lamb and in a sweet-and-sour tomato sauce but your gravy sounds incredible! I'll have to make another bath up soon. This is the best and most thorough recipe I've ever found.I love how you suggest to trim the cabbage vein,...not cut it out. We like it with a little drizzling of Heinz ketchup glazing the top of the casserole baked dish. I make these all the time, the REAL Polish way. There is no way in hell that Polish people would add Worcestershire sauce to "Gołąbki" (ewww!). However, we do add diced mushrooms, crushed garlic, and tiny minced pieces of pickles (yes! pickles!) to the meat and rice filling, along with the onions already mentioned. Also, NEVER , EVER Tomato soup for sauce (ewww again!). We take fresh tomatoes, condensed tomato paste and mix them with 1/2 can of chicken broth (or hot water with chicken bouillon) + 1/2 teaspoon of sugar and at the end, we thicken the sauce with SOUR CREAM, and also season very heavily with chopped DILL and with pepper. Thank you for your comment Paulina. Every family has their own recipe. I like the idea of adding the chicken broth to the sauce! We all have wonderful memories of our Polish Grandmothers, the right taste, smell, etc. I wonder if my lovely grandmother was still here if she wouldn't go ahead and use the pre-canned tomato soup! She worked very hard and to know of a little convenience item may intrigue her! And my Grandmother would never add mushrooms and pickles. Yay for your memories. Yay for mine! Thanks for sharing this recipe Patricia. I will add my own 2014 ingredients and I'm sure my Mother and Grandmother would approve! My Grandmother was from Krakow, my Mother was first generation American. As Carol said, we all have wonderful Polish family memories. My grandmother, a first-generation Polish-American born in New Jersey as her parents journeyed from Poland to Chicago, used soy sauce, dry onion soup mix, and canned tomato soup or juice in her recipe. She did not use pickles. Celebrate all the different choices our Polish heritage represents! For novices to this recipe you can see Jenny Jones (yes, the former TV talk show host is Polish and speaks it too!) actually rolling the cabbage rolls using a variation of a golabki recipe. And Patricia Stagich, you are right! EVERY Polish family has their own versions of this recipe. I'm definitely making this tonight...I may tweak it based on the comments. I'm very excited. Thanks for the very detailed recipe! Recipes are for tweaking! No one says you have to follow every ingredient! Make it your own! I have a traditional guamki recipe my brother got from a friends Polish grandmother. I've only made it once. I'm looking for suggested side dishes (2 maybe) to serve as a Polish dinner. Any ideas would be appreciated. We always serve with mashed potatoes. They just seem to go together! My mom, 1st generation Polish-AmericN, always had mashed potatoes and this version of green beans... 1-2 cans of French cut or regular green beans . Drain liquid. I use microwave, cook in serving bowl with 1-2 tablespoons of margarine or 1\2 c of butter, cook about 3 minutes on high. Then coat with Italian bread crumbs. My mom used plain and seasoned with a little onion and garlic powder. I prefer using Italian bread crumbs. My babchi, used fresh everything to make this but I now use fast version. Lol. My grandparents were Polish and we ate a lot of Polish foods, during the holidays and always at Polish weddings. Golabki (we pronounced it gawumpki also) was made quite often in our household and made very close to this recipe but we used veal instead of pork. Thank you for posting. I'll definitely have to make them! Veal would also be delicious! Thank you for your comment! This sounds so good!!! 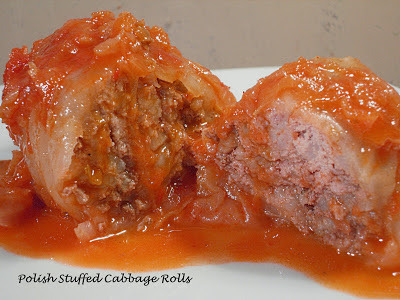 I love me a good cabbage roll. I have a recipe much like this but I freeze the cabbage first so don't have to boil it and I don't cook the rice as the juices cook it. Add chopped onions, celery, crushed garlic and whatever spices you like. With freezing the cabbage first makes it easy to peel off the head. After the cabbage rolls recipe is a note for Grandma's Sauerkraut. 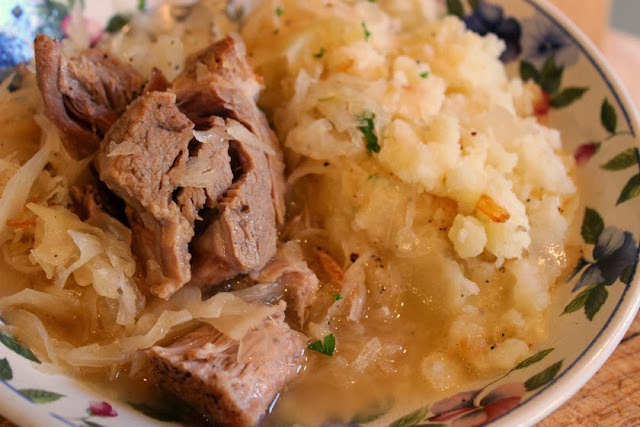 If you were adding the sauerkraut to the cabbage rolls, would you use the salt pork and gravy? Would I need more tomato product to have enough sauce? Hi chpetunia! You could add the salt port and gravy, but I feel it would change the taste of the sauce. If you feel you need more sauce, add another can of tomato soup with water. My mum also adds rice ............make sure its not over cooked. After they are made we either make a tomato base sauce OR shallow fry till golden.......with bacon.........yummmmmmm!!!!!! I'm 65 yrs old and was a teenager in late 1960's, my Grandmother was from Warsaw. She made this dish with Campbell Tomato Soup! This is what attracted me to your recipe. I plan on making this this weekend. I am Polish and Russian. I have made Stuffed Cabbage before. I have tried to remember my mom's recipe but it never seems to be the same. But after reading your's and making it I am in heaven. This is just how she made it. My mother's mother was from Krakow and her father was from Russia. Your web-site is a blessing. I have found just about all my childhood recipes that my mon made. can you freeze it before you bake it or does it have to be after? When do you freeze it before or after cooking? My Mother-in-law never used worcesteshire sauce and only raw rice which cooked as cabbage rolls cooked. Mine never taste as good as I remember. She always served it on a bed of mashed potatoes. I made these today. They're great! I salted the water for cabbage, salted the leaves after I blanched the and also salted every other component. It still could use a little so don't be shy with it! Shrimp Cocktail Mold - Semi Retro!